Check the sidebar for information on both challenges. I combined the NAIL prompt with the Halloween challenge today. When I googled pumpkin faces most of them were traditional orange background, line marks and funny or scary faces. I love pumpkins but I always got bored of the bright oranges ones. They were so monotone! My favorite were the tiny abnormally colored ones. They were a lot more rare and just looked cooler! 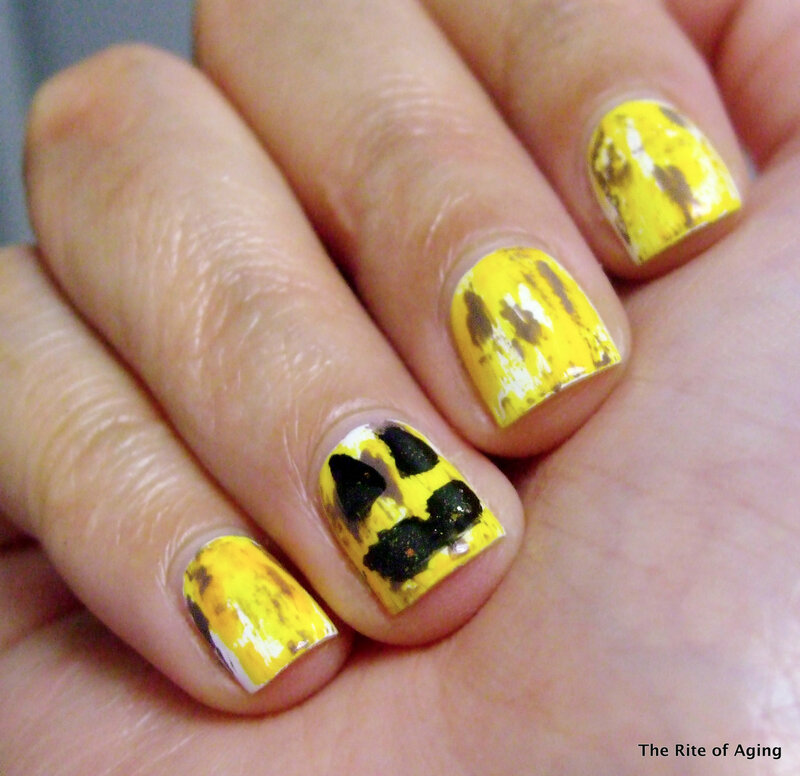 Distressed nails are very RA-friendly and work perfectly with these pumpkin’s look. I am very excited I can inject a little more “nail art” into today’s manicure to make up for yesterday! Anyways, I hope you like my “jack-o-lantern” nails. These were really fun to do! I started with 1 coat of Milani Spotlight White as my base. I “distressed” with Color Club Almost Famous, Sally Hansen Miracle Gel Short Cir-cute, and Sephora by OPI Metro Chic. Check out the other pumpkin faces below! Thank you!! Ahhh! I’m totally seeing the scarecrow thing now…yikes! Hahah, scarecrows really freak me out! You’re absolutely right – the distressed background makes a perfect pumpkin base! The colors look great together and I love that you made the accent nail into the face. Thank you, Ali!! Admittedly, I really need to work on my freehand work…have you had success cutting your detail brushes to smaller sizes? I love love love the distressed look! And also that you went a total non traditional way with your colors! Well done!